From the Archives. 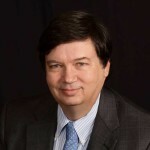 The following article first appeared on TrinityMemphis.org on Sept. 2011. 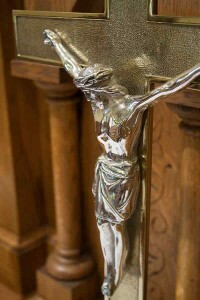 The figure of Christ on the crucifix that sits on the alter has been restored to its original shine. Crucifixes are not a common sight in Lutheran Churches, but this one has been an important part of Trinity’s worship for decades. No one knows how it is that the Christ figure on the crucifix that sits on Trinity’s alter went so long without polishing. My suspicion is that it changed so gradually over a period of time that the tarnish went unnoticed. But it had become a dark, dirty gray with streaks of black that looked very unattractive. When I first saw it, I asked the alter committee about it, and no one knew. None of them had ever known of the figure to be polished and had not done so themselves. Mrs. Linda Wilkins tells me that photographs dating back to the1960’s show it with the same amount of tarnish that it now had, but a photograph taken at my baptism in 1955 shows a shiny figure on the cross. I suspected that perhaps the figure was plated and that years of polish had worn the silver away and for that reason it had stopped being polished. Whatever the reason, it appears that it had indeed not been polished in a very long time. I got permission to attempt to polish the figure. I promised that if indeed the plating was worn through, I would have it replated. This is how the figure looked prior to polishing. I mentioned my plans at lunch with my father. “As old as that thing is, I doubt very seriously if it is plated,” he said.I asked him just how old it is. He said that he didn’t know. He couldn’t remember if it was there when he was a small child or was added in his lifetime. He came to Memphis in 1927. After first publishing this article, we discovered a photograph of the sanctuary in 1930. There was no cross at all on the alter at all at that time. “It’s very odd that we should have a crucifix,” he added. “Traditionally, Lutherans use the bare cross to represent the risen Christ. Catholics always have the crucifix showing Christ suffering on the cross.” He suggested that it might have been a gift to the church from someone that was not aware of the distinction. Encouraged that it might be solid silver, I brought the cross home and examined it closely. 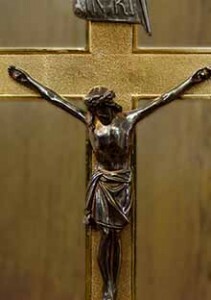 The cross itself is solid brass. The fact that it is lacquered and that the lacquer has held up without discernible darkening suggests that it is likely from the twentieth century. To my delight, both the INRI plaque and the Christ figure are solid silver, and polishing it was relatively simple; not more than four or five hours work at most. Not all that much considering how long it had sat. While this is not exactly Ezra rebuilding the temple, it is exciting to see the progress being made at Trinity. It looks like at long last, we have discovered a solution to the moisture problems in the walls, the crumbling plaster is being scraped off and restored, the fellowship hall carpets have been scrubbed and cleaned, soon there will be new painting inside and out, and the Christ figure has been polished. I have worshiped in front of that very cross for my 38yrs…baptisms, deaths, marriages..and have wondered the reason for the typically Catholic symbol, but when your eyes drift upward..to our Risen Lord, bearing His scares…there lies my peace. …but alas,David, thanks for fixin’ the the crucifix! Ditto to Turner Clan comment. These are where my eyes fixate during communion. Think that is why I always leave the table teary and finish the service in my pew sniffing from the teary event. Then I leave renewed after the last hymn.